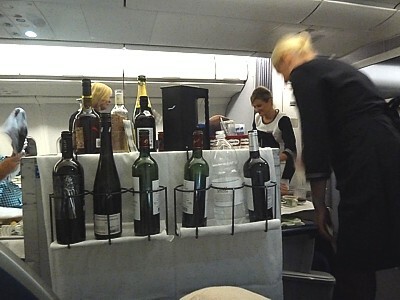 News: Finnair are introducing what they call their "Self Select Bistro Service". In effect this mean you pay in advance for your food arouond Europe in economy. When you are booking, Economy Class passengers can pre-order inflight meals for 10euro. Finnair inflight meals offer five meal options for €10: Salmon Salad, Tomato Enchilada, Beef Burgundy, Pasta Bolognese and Chicken Korma. Finnair airlines reviews and opinions can be decidedly mixed; inconsistency is one of the few consistencies about Finnair, but in general it’s not too bad; not up there with the world class of airlines, but with a solid, middle of the pack certainly. 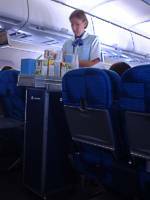 As soon as you get on board you know you are in a "blue environment" - the seats, windows uniforms, menus, pages on the IFE. You also notice the rather quaint 1970s easy listening lift music - in Finnish - which is played in a calming fashion. If Finnair seems a little old fashioned, well, at least it could be worse. There is the usual scrum to get on board – particularly for the late night flights from Helsinki – and the gate often opens early for just this reason - Finnair like to get people on board a good 45 minutes before the plane departs - and you'll even get a ticking off if you arrive 30 minutes before departure. While you're on board, take a minute to look at the new Finnair uniform worn by the crew. It was introduced in 2002, and was designed by Finnish designer Anna-Kaisa Huttunen. And very smart it looks too. In Finnair Business Class you won’t be guided to your seat, but pretty quickly as soon as you sit down newspapers are offered – alas this is typically just a thin reprint of the Helsinki Times; there are sometimes a few magazines such as Newsweek too. 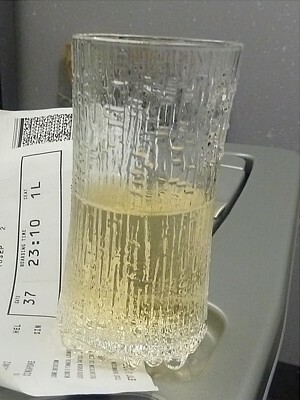 Make sure you grab a pre-flight Sparkling Wine or orange juice – the purser generally walks briskly up the aisle with these, and they come in lovely 1920s-style raindrop Finnair glassware. There is also a bottle of fresh spring water in a pocket beside the seat. Menus (both for food and wine) and amenity kits are also handed out, but these really aren’t great. The Amenity Kits in particular are cheaper than most airlines economy versions, with socks and an eyemask in a recycled paper bag – if you want anything else, go to the toilets, where toothbrushes are in a small wickerwork basket. The basket also contains shaving equipment. One delight is in the toilets where there is a comprehensive cosmetics basket, containing Lancôme Trésor scent for women and Sergio Tacchini Stile scent for men, Lumene moisturizer and a Biotherm aromatherapy face spray bottle. 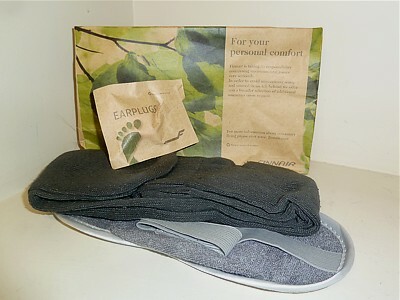 On the Finnair to Japan flights there are separate travel slippers handed out. Finnair's food and drink service has won a number of awards, and certainly transatlantic or to Asia it looks impressive on the menu – however in reality it can be a bit lacking, because on the evening departures to Asia Finnair now offer a ‘sleeper’ service with much smaller portions and fewer options (however it is impossible to now eat in the lounge before the flights) on Helsinki to Bangkok, Singapore and Hong Kong, where there is a lighter evening meal (because it leaves Helsinki so late). However in no way do Finnair let you sleep for longer – the cut down meals still take a full two and a half hours to serve, and generally start about an hour into the flight, as the lights are snapped on (just when you’d got to sleep) and tablecloths are laid. Nothing much then happens for half an hour until trays are put on top of your tablecloth. Service starts from the front right, and proceeds down this aisle, and then the left aisle –to maximise sleep seat 1L comes at a premium, as it is served first. At least to speed up the service, wine bottles are clipped to the side of the food trolley. Dessert comes in the form of a tub of icecream, and twenty minutes later the drinks trolley revisits, offering cognac or coffee (but you get odd looks if you ask for both). And that is basically it - no drink topups during the flight - if you want anything else, you have to visit the snackbar in the galley. Transatlantic and the flights back from Asia are better, as you are offered two starter options, soup, three main course options, and cheese or pastry as dessert options. There is a small snack bar in the galley, but it has few options – really just the leftovers from dinner. Mid-flight there are snacks in the form of sandwiches/chocolate/crisps/fruit from a basket, and then a fully breakfast (or a snack trans-Atlantic) is served before landing. This again is a nasty shock, with the lights snapped on a full two and a half hours before landing, but you have to wait a good 45 minutes again for some breakfast. Finally, Business Class customers leave the aircraft first, and the curtain is closed to allow you off the aircraft before the great unwashed in cattle class. Finnair economy class long-haul is adequate, but nothing special. Newspapers are generally offered on board, except from Helsinki (and a few other destinations like Paris) where there is a rack by the gate (containing all the Finnish dailies, plus an English language FT). In Economy Class on intercontinental flights, a bottle of fresh spring water is distributed at the doorway or ready in the seat pocket. Meals take some time to come around, with two trolleys (one per aisle) going very slowly from front to back. Beware of the different drinking policies, according to the flight times. To Dubai you have to buy all alcohol. To New York, Toronto and Bangkok you get a free beer or wine (one only) with the first meal. To China, Japan, South Korea, India and Singapore there is free beer and wine – but all the time, not just one with the meal. On intercontinental flights everyone is provided with a blanket, and a pillow sitting on the seat. On European flights, a few blankets and pillows are also available (and generally if you ask for them, the crew will get you one pretty quickly) are distributed to passengers. On Finnair in Economy longhaul also offer free playing cards for passengers on long haul flights - you may get some head-scratching when you ask for them, but available they are. 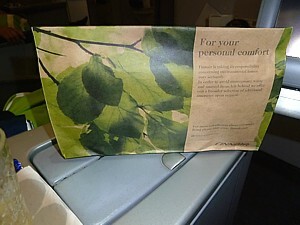 Aircraft also stock a supply of writing paper, envelopes and pens, which are obtainable from the cabin crew on request. 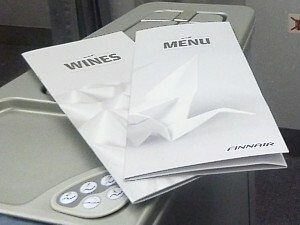 Each aircraft also has copies of Finnair's timetables. Postcards however are no longer available. On Finnair Business Class short haul (trans-Europe) there really isn’t anything fancy – no newspapers, no entertainment, or even a pre-flight drink. However there are menus (with typically just one choice), and once the meals have been served there is a free bar. In economy short haul on Finnair it takes about half an hour for the trolley to first come round, with service from the front, with a cold salad or sandwich is served, together with non-alcoholic beverages. There is however alcohol on the trolley if you want to pay for it. Finnair flights operated by Flybe (the shorter flights) and domestic flights have only some snacks for sale and free non-alcoholic beverages. The Finnair Business Class amenity kit is no great shakes.– Indeed, it just seems cheap and a bit penny-pinching. It comes in a cheap paper bag, and just contains socks and an eyemask. if you want anything else, go to the toilets, where toothbrushes and shaving equipment are in a small wickerwork basket. One delight is in the toilets where there is a comprehensive cosmetics basket, containing Lancôme Trésor scent for women and Sergio Tacchini Stile scent for men, Lumene moisturizer and a Biotherm aromatherapy face spray bottle. On the Finnair to Japan flights there are separate travel slippers. Finnair has a pretty standard baggage allowance for each flight, but still uses the piece concept (total number of bags), rather than the total weight concept, and unusually also applies this on routes to Asia, not just the US. Another Finnair oddity is the tight restriction on cabin bags for business class. Cabin Bags: Both Economy Class and Business Class passengers can only take one item of hand luggage of one bag weighing up to 8kgs, or for business class of 10kg. Business is also permitted a laptop, and business perks extend to Finnair Plus Platinum, Gold and Silver members. The main carry-on bag must be no larger than 56x45x25cm (22x18x10 inches). Rules on contents (such as liquids) apply. Check in luggage: On all intercontinental routes except to Dubai economy class can check in one bag weighing 23kg, full fare economy (called Economy Pro) can check in two pieces, and business class can check in no less than three bags each weighing 23kg. Routes from Helsinki to Europe, and to Dubai are the same, except for Business where there is a limit of two pieces of baggage. The sum of the external dimensions (length + width + height) of each piece of baggage can be no greater than 158 cm. Finnair Plus Platinum and Gold members are allowed one extra piece of baggage regardless of travel class. Finnair's website has details of exactly what you can take onto a flight.